It's the first known bioshelter in Central Massachusetts. It was designed by WPI students, and those involved with the project say it has the potential to provide much more than a year-round, healthy food source to underprivileged Main South residents. The nonprofit Worcester Common Ground (WCG) unveiled the city’s first bioshelter last week during a ribbon-cutting ceremony. The project was completed in conjunction with a Jaques Avenue rehabilitation project that will provide low-income housing to four families. The innovative and interactive greenspace was created through a partnership with WPI students and faculty, and relies on natural processes, such as energy from the sun and rainwater catchment, to create an environment to grow food year round. Construction on the structure by Worcester’s YouthBuild students began in the summer. The bioshelter is part of an effort to increase the accessibility of community greenspace in the neighborhood, says Yvette Dyson, executive director of WCG. It will serve as a place for environmental and sustainability learning, community interaction, and access to fresh produce, she explains. She and others hope it will become much more. “We hope the bioshelter will become a beacon of boundless potential for the community—agricultural and educational empowerment,” Dyson says. Bob Hersh, instructor in Interdisciplinary & Global Studies, and co-director of the university’s Center for Sustainable Food Systems, put together a team of WPI students in 2012 who worked with the National Center for Appropriate Technology to come up with a conceptual design. The students also produced a report comprising their research. 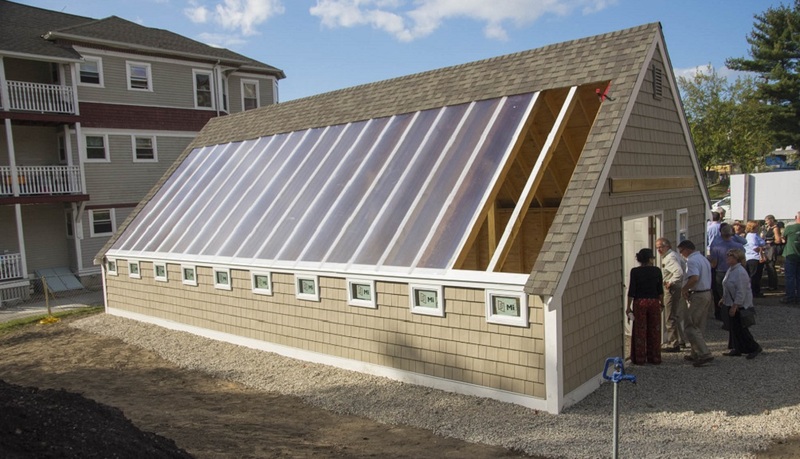 “The idea was to put it on an urban lot in any city that has similar climate to Worcester, utilizing a passive-solar greenhouse that uses thermal mass, water, or concrete to capture and keep the heat of the sun and dispel it over time to keep plants growing—eliminating the need for fossil fuel in winter—and growing year-round,” Hersh says. The WPI team provided plans for an attractive, long-range community development project that incorporated meeting places, like a pergola—a place conducive to sociability, recreation, and nourishment, he says. In 2014 the Worcester Tree Initiative received funding to plant more than 20 fruit trees on the perimeter of the lot and add raised garden beds, he said. The bioshelter was constructed on the back third of the property. WCG is still in the process of completing the interior of the bioshelter, which will be aided by supporting organizations, she says, including groups providing solar panels and insulation. They are looking into a collaboration with Peace Corps volunteers who have expertise in farming to coordinate educational opportunities with surrounding schools. They are also working with interns from area colleges to teach residents about utilizing the bioshelter. “We continue to work with WPI students as they share their thoughts about the bioshelter in order for residents to have a community space to call their own,” Dyson adds. “One student has mentioned building a rocket stove. We can’t wait to learn more about that. "Truth be known, our residents are not short on growing knowledge. They have taken their own initiative with the raised beds and have fed their families fresh veggies this past summer. Over the past 18 years, WCG has created public garden spaces that include the Tot-Lot on Austin Street and EAT (educational agricultural training) Centers that have been crucial to refugee farmers who maintain the gardens on a yearly basis. Dyson says the bioshelter will take sustainability to a new level for residents. Funding for the Jaques Avenue rehabilitation project was provided by Saint Gobain, Greater Worcester Community Foundation, Eastern Bank Charitable Foundation, and others.